Artist and student at Putney School of Art and Design, Melanie Bellis, has been selected for the prestigious Royal Academy Summer Exhibition. Bellis’ celebrates London’s architecture through drawing urban spaces and transforming them into atmospheric etchings. 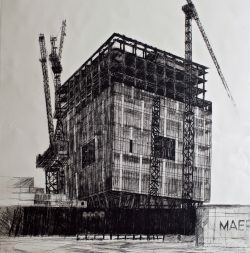 Recent work includes contrasts of new construction alongside old established buildings, this inspiration drew her to the Nine Elms site where the new US Embassy is being constructed. The drawing was turned into an expressive etching which was selected by the Royal Academy for the 2016 Summer exhibition. You can view Melanie’s piece at the Royal Academy from Monday 13 June until Sunday 21 August. As the major regeneration of Nine Elms on the South Bank progresses at a pace, the area is rapidly shaping up to become one of London’s most innovative and vibrant quarters. The new Nine Elms Park will add to the Vauxhall Pleasure Gardens and a new stretch of the River Thames Walk, lined with cafes, bars shops and galleries which will give the area a rich mix of culture and green space just a few minutes from Westminster and the City. Other key attractions in the pipeline will included a revived Battersea Power Station, the new Dutch embassy and a new centre for London’s foodies at New Covent Garden.